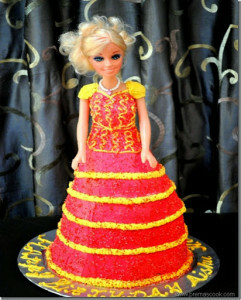 I have been making many Barbie dolls cakes from the time I started for my daughter’s birthday couple of years back. That cake recipe and how to make Barbie doll cake I posted long back too, after which most of the time for my daughter or her friend’s birthday request always come to Barbie doll cake. Of course little gals love their Barbie . After Aishu birthday party everyone asked me to make same kind of cake for them too and specially her friends. I always customize cake design to suit party theme or dress of birthday girl. 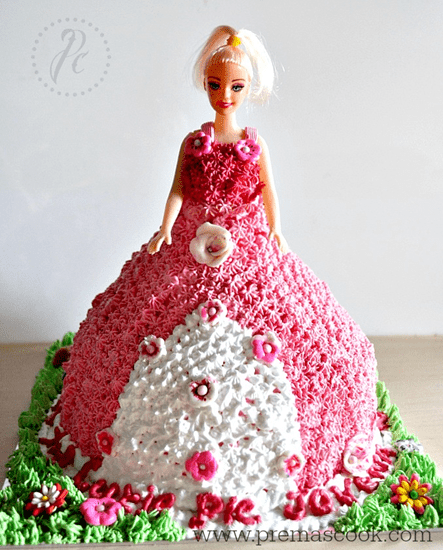 Recently I made this cake again for Aishu’s Friend Kirthu, baribie i just asked her what colour you want,immediately she replied Aunty i want same like my dress.Then i tried to made this custom design cake for her.Here is the Barbie cake. 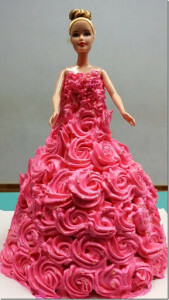 In this Barbie cake i have chosen the rosette design and 3 contrast colours for the skirt. The icing can be piped on to make it look like a fancy dress. I used 2 cups of whipping cream frosting which has been divided into 3 parts and then i have added 3 contrast colours in it. This cake i made long back ago .It is garden theme cake.I used the star tip to make the skirt and used grass tip to decorated bottom of the cake.I used lot of fondant flowers to make the cake beautiful. Made black forest cake for this barbie and below pic shows how i assembled the cake. how to assemble cake : You can make barbie doll cake too and impress your family, friends it’s very easy and look into my steps wise pictures for proper direction . 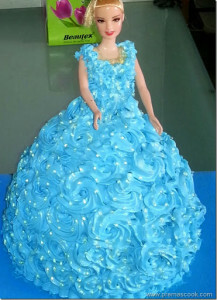 The next is the Blue barbie doll.I used rosette deco for this cake and did glossy looks on top.It makes the cake more shinny. The next cake i made for Aishu’s birthday.Hope you all seen it before.You can see more detail instructions here. This is also a cake which is made for Aishu’s birthday. Wanna more details about cake please check here. The next one is the pink Barbie,this i made for my friend daughter’s birthday party.The theme is pink so i made the whole cake with the pink rosette design. After i made this cake, i thought of uploading the video for How to make Barbie cake. I hope this video will help you guys to make it in a easy way. 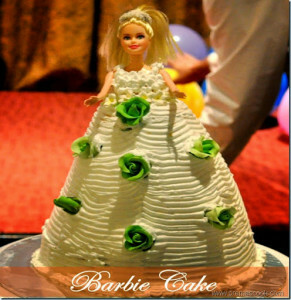 Make your own Barbie doll cake for Birthday Party and enjoy. 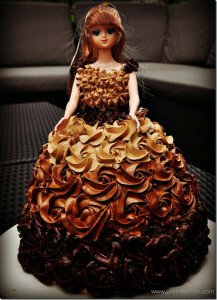 love all the barbie cakes here, gr8 wrk!!! My only wonder is how do you transport this to your friend’s house? You must have lot of patience and creativity to do all these.